For our twelfth interview of the month, we caught up with the up and coming rapper from East London to talk amongst other things, about the Jump Off battles and his agenda in rap. From East London and been rapping for around 8 years. Do you have a crew, and whats your local scene like for hiphop? I don’t have one specific crew. I’ll work with anyone as long as they’re safe and not wack. I’ve got my own label, Left Turn Records. What one artist had the biggest effect on you in wanting to be one yourself? How do you think you performed in the Jump Off street battle, and are you gonna be doing any more? I thought they went OK. I just saw them as a laugh and as a good way to get more exposure in the scene. I’m not gonna do any more battles. I just wanna concentrate on the label and putting out good songs. Describe your music to those that are yet to hear it. How do you sound and what kinda thing do you rap about? I make good Hiphop music that has a live element to it. So far, I’ve been into beats with heavy drums behind them and good samples. I try and change it up though, so if a beat’s ill and not what I’m used to, I will use it. I don’t come with no fake accent when I’m rapping and spit as if I was talking to you. My topics range from everything I’ve experienced or going through. I keep it as real as possible and I feel that is reflected in my shows and songs. How did you hook up with DAT Sounds and what projects have you got in the works? I went to school and grew up with them man still, so it’s all love. They work hard and deserve the respect they get in the industry. At the moment I have a 12” out on Left Turn Records called ‘Live n Direct’ that’s been getting some love. I am also working on a CD entittled ‘Attack Of The Killha Loops’, also on Left Turn. I’m also featured on DJ Air Adam’s mix tape, ‘Real To Reel’. What producers do you work with and have you ever messed with beat making yourself? Too Many Cooks and Biskit Factory (Manchester), DJ Kryptonite (Stoke), Darren Paul (Birmingham) and Kal Seriouz (London). As you can see I don’t care where man is from. As long as it’s a good environment and I feel the beats suit me, its all good. I’ve always wanted to produce but never got round to it. I feel all artists should produce for themselves. Are you involved in any other aspect of hiphop culture like breaking or graffing? Nah, but they’re the reason I fell in love with Hiphop. As a kid, I would see heads breaking, tagging and DJs doing their thing and think it was sick so I always represent for the B-Boys at shows and with the music. What UK acts do you rate most highly and would most wanna collaborate with one day? Sway’s work rate, Klashnekoff’s lyrics, Shameless’s versatility, Sonny Jim and Kosyne for the freestyle skills off the top of my head. I’m feeling a few grime heads like Ghetto and Trim but anyone doing their thing in the scene really. As long as you’re being productive and moving forward I’m feeling. In terms of collaborations, I would like to get at Diversion Tactics, P Brothers and Dirty Diggers. Do you listen to much outside of rap, and if so, what effect do these genres have on the hiphop you create? Yeah, it’s all about having an eclectic taste. I’m feeling Grime and I’m into Garage and Jungle for sentimental raving purposes. Haha. I like soul, funk and reggae as well as jazz and parts of rock. I’ve got friends that are into everything so it helps me to get into other forms of music. I think funk, soul and reggae has effected my music so far. I mean, that’s how Hiphop started so it’s a natural link to those genres for me. What would be your dream come true in the context of your hiphop career? Where can heads find out more info about you. Web link or something? Do you wanna make any shout outs? Yeah props to rapnews.co.uk for this. Safe to Dat Sounds and Local Hero, Bare Records, Too Many Cooks and Manchester heads. DJ Cro and Brum Heads, Krypto and Creative Juices in NY. Everyone who knows me and knows what I’m about. Safe. Anglais… Dave left this on our forums. Hope London’s doin’ you well an’ your career’s goin good… Got copies of the 12” and it’s sounding proper! 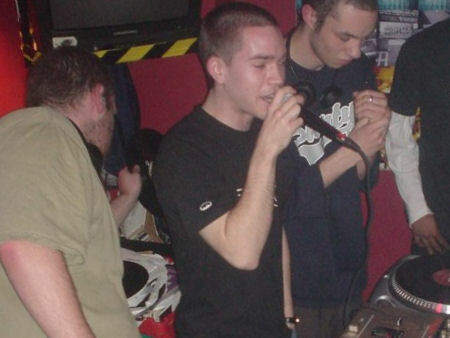 Take it easy in 2006 (and dont forget, Kev’ can STILL “merk” you in the cypher). Payce. This man is one of the sickest freestylers I know… One of the main reasons to check out Monkee in S-O-T! Keep up the amazing work Ben. Good to see you’re still putting it out there! Hope the demos we put together worked out for ya. 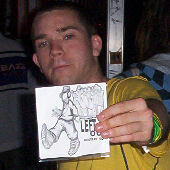 Anyone wanting to hear something decent, check it out – this guy lives and breathes hip hop. i’ve seen him eat chips. but bigup cha sen do! HEY YO… man remembers this dude from leytonstone, rockin his bust up leg and linkin his black gash.. but man does have a sick freestyle, with them “beans on toast” lyrics.. oh and ill have to hook up a likle freestyly battle with u and rocky.. shine up them battle lyrics… and u need to bring man the 12”..